eauty, sensuality, intimacy…can any of these exist without vulnerability? And yet at a time when self-identities are pushing at boundaries and many are rejecting gender expectations as restrictive, even unhealthy, the last hold-out seems to be the myth of The Impenetrable Man. Masculinity as synonymous with, if not dominance and aggression, at least keeping everything under control. As Alessandro Tomassetti observes in this interview, even in the contemporary art scene, which has always served as a mirror to what is happening in the larger society as a whole, it is still for the most part women who are breaking out and expanding self-expression, widening and deepening the conversation around what it means to be human. It is predominantly women who are baring their inner lives, the private yearnings and passions as well as wounds and fears. For men to make themselves vulnerable in this way terrifies us. Should imperviousness no longer play the role of Gate Keeper to the inner lives of men, what would keep emotions from spinning out of control? And what of the man who allows himself to at last drop to the ground? If he crumbles and falls, he may never get back up. As most societies still are structured to reward men for fulfilling the role of primary wage-earner, male invulnerability is no minor matter. Such is the tension Tomassetti captures in his paintings. As you look them over, notice your own reactions. What seduces and what unsettles you? Where the men are vulnerable? Or where the artist brings you close but no further? Deanna Elaine Piowaty: There is a definite animal quality to your portraits. The men you portray exude the sense that they are completely in charge of what is being seen and how the story is told. And yet also present is a feeling of vulnerability, even objectification. What is it you wish your viewer to take away from your paintings? Alessandro Tomassetti: I’m most interested in that space where our assumptions about how a man is supposed to be can be played with or challenged or modified, so finding the vulnerability that you mention is key. I’m introduced to most of my models through Instagram, and nearly without exception I’m taken aback by the gulf of difference between the persona they inhabit online and the person I end up meeting. They are almost always softer and gentler than I expect them to be. And yet, when we start to work, most of them quickly assume their selfie pose, the one that shows them at their most masculine and strong. Oftentimes, to encourage them away from this pose means to hear about their insecurities and fears, which puts us in a more intimate place. From there, I can access the things I need for my painting. I think what my viewer sees, and what I’m happy if they do, is the synthesis of these divergent aspects of the model. Alessandro Tomassetti: The animal quality you mention is not something that I think about or plan for a painting. I wonder if it just comes with the territory of representing masculinity in a society that, for better or worse, assumes men to be in charge by default? I think there is an element of confrontation and seduction that carries through most of my work but I see this more as the “top note,” the thing that might attract you in the first place. On closer viewing, I try to provide enough information through the brushwork, glints of light and reflection, the gaze and expression of the model, to take the painting from an archetype of a man to the representation of a specific person. I often hear, “I feel like I know that guy,” about my work, which, for me, is an indication I’ve done something right. Deanna Elaine Piowaty: Has there been an important element missing for you from other artworks you’ve come across over the years that you set out to infuse in your own pieces? Alessandro Tomassetti: I can’t say that I had any grand intentions when I started out; as a latecomer to painting, I was just happy to finally be doing it. That said, I did come to realize that all the years I spent on the sidelines, watching other artists create in ways that I wouldn’t allow myself to, provided a lot of hints as to the direction I should go in. 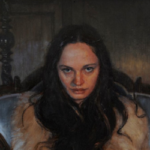 Most of the contemporary figurative artists whom I admired paint women and through them, the subject flourished. Femininity was being represented in all its complexity and I loved that the combined work of these artists told a story about women in our current culture. I didn’t see a lot of work featuring men in the same way. 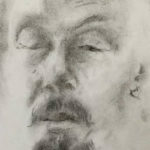 Male portraiture, in my mind, was still the stuff of CEOs, politicians, church leaders and other “powerful” men, so my goal became to document how I perceive a specific version of masculinity at this particular time, and to paint men with the same reverence that my contemporaries had for their female subjects. Deanna Elaine Piowaty: In a recent interview, you spoke about “flipping the script on the male gaze.” Could you elaborate on this? Who is your intended audience? Do you have a specific viewer you have in mind as you develop your ideas? I think there is something to be said, and gained, from straight men being able to see the beauty in another man, and in women being able to see the beauty in a man outside the masculine norm. Deanna Elaine Piowaty: Your background in fashion definitely comes through in the staging of your portraits. That famous line from Shakespeare, “clothes maketh the man,” gets turned on its head here, as you drape your models in sensual attire that challenges the definition of masculine, even as their confident, even cocky demeanor appears to be daring the viewer to conclude otherwise. I’m curious to hear your reason behind creating this tension between body posture and costume, rather than presenting the two more harmoniously. Would the viewer feel less challenged, do you think, and therefore less stretched, had you painted your subjects with a gentler, meeker, gaze ~ what we typically view as more feminine? Alessandro Tomassetti: First of all, I love that scene; even though Polonius is meant to be a bumbling fool and his speech is usually played for laughs, I always feel a tinge of sadness that he was so far off from the person he wanted his son to be. The norm of what “real men” should be or look like has always been a bit foreign to me. As a teenager, I had health issues that left me with a scar down the center of my chest. I remember opening up to my parents about how it made me feel self-conscious. My mom did the typical parent thing and told me it was barely noticeable. My dad surprised us both by saying he could relate, that as a young man, he’d wished he had more hair on his chest because that was a symbol of manliness to him. I was dumbfounded. It had never occurred to me that my dad might have struggled with the idea of what a man is supposed to look like. All this to say, every era has its version of how men and women should look and every era has people who conform to it or rail against it. The tension created by putting men in things we consider feminine, and vice versa, has been a mainstay of fashion for decades. Think of Gaultier in the 90’s, Thom Browne in the 00’s, and Moschino just a few weeks ago! Alessandro Tomassetti: And that’s not to mention Bowie, Boy George, Prince and all the other musicians who have fucked with gender and fashion norms in iconic ways. Alessandro Tomassetti: That contrast of expectation and actuality, whether attractive or repulsive, is often unforgettable. When I first saw Annie Lennox in a men’s suit and a shocking orange brushcut, I remember thinking the 14-year-old equivalent of, “What in the fabulous hell?” as my mind raced with the possibilities. Alessandro Tomassetti: To this day, the album cover for Touch has pride of place in my living room. Alessandro Tomassetti: Now, I’m not saying that painting a defiant-looking guy wearing a vintage corset, a lace glove or a fur will create the same lasting intrigue, but it certainly invites the viewer to take a closer look. If I were to present the men I paint solely as beefcake, well, that’d be the end of the story. 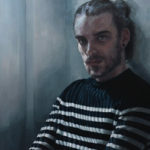 Barcelona-based realist painter Alessandro Tomassetti has been listed as among the Top 100 Figurative Artists Painting Now. Two of his paintings have just been selected as finalists for this year’s Art Renewal Center International Salon. Tomassetti holds a degree in Fine Art and Art History, and later specialized in Fashion Design and Computer Animation. His first career was as a special effects artist for Disney Feature Animation. To view more of Alessandro Tomassetti’s work, please visit his website. Or follow him on Instagram: @sosayssandro.